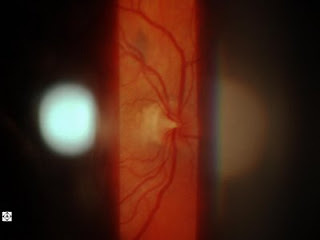 The little brown spot above the optic nerve between the blood vessels (it’s really below the optic nerve but during examination it looks above it) is a choroidal nevus in the left eye of the same patient with the vacuole below (how’s that for a run-on sentence!). A nevus is present in about 5-10% of caucasians. Growth occurs mainly during adolescent years so any growth in adulthood is suspicious. As nevi go, this one is very small and very unlikely to ever grow into a melanoma. However is should be monitored with dilated eye examinations on a yearly basis.